An easy to bake Tropical Chocolate Banana Pecan Bread and simply heavenly! The very first time I brought this banana bread in at work, a co-worker took one bite rolled her eyes and uttered “orgasmic”! It’s most certainly that good. This tropical chocolate banana pecan bread will be a huge hit at your next family gathering or potluck. 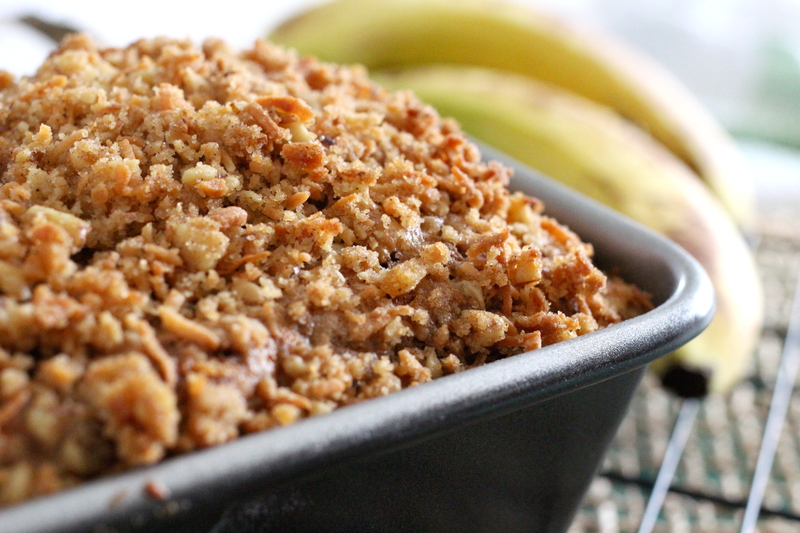 It has always been my go to banana bread recipe whenever a craving hit and a no fail recipe. Even beginners will appreciate the simplicity of this sweet loaf as its not complicated to put together and yet so amazingly delicious you’ll want to bottle the tropical aromas. 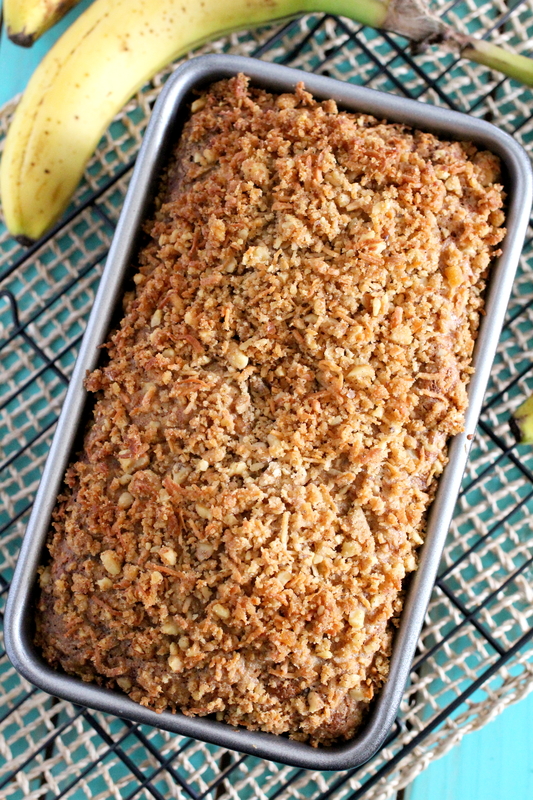 While the mashed bananas render this sweet loaf moist, the pecan and coconut topping adds a lovely crunchy bite in contrast to the loaf itself. When using bananas for baking, make sure they are ripe with brown freckles but not bruised. If you have an abundance of over ripe bananas you can freeze them, with the peel on, sealed in a ziplock bag. When you’re ready to use them, simply bring them out to thaw. Peel the bananas and add them to your favorite recipe. Consequently, you will need approximately 3 medium sized ripe bananas to equal one cup of mashed bananas for this recipe. Although a potato masher comes in real handy when mashing the bananas, a fork will do just fine. I omitted the raisins from the original recipe and added the chocolate chips and pecans simply to suit my personal tastes. I’m just not a fan of raisins in my desserts! Alternately, walnuts can be substituted for the pecans if that is what you have on hand. Bake this Tropical Chocolate Banana Pecan Bread today and enjoy with your favorite cup of tea, coffee or simply a cold glass of milk. Grease a 9 x 5 inch loaf pan and set aside. Preheat oven to 325*F (160*C). In a large bowl beat together the butter and sugar on medium speed just until light and fluffy. Next, beat in the eggs one at a time, beating well after each addition. If you are using a stand mixer make sure to scrape down the mixture a couple of times. Stir in the vanilla. In a medium sized bowl combine the flour, baking powder, baking soda and cinnamon. Stir the flour mixture into the butter mixture alternately with the mashed bananas just until combined. Do not over-mix. Fold in the chocolate chips and chopped pecans. Pour the batter in the prepared loaf pan and sprinkle with the coconut topping. Bake in preheated oven for about one hour. The loaf should be golden brown. I always check to see if it is done by inserting a toothpick in the center. If it comes out clean it is done. If it is wet, bake a little longer.